Cornerback is the most peculiar position on the football field. It’s an isolated position and one of the only positions where a great player can be neutralized simply by being ignored. Those Saturdays and Sundays of being ignored on the field usually comes with the reward of respect and notoriety in the form of accolades and media coverage. The top draft prospects at the position are invited to all-star games and are interviewed by multiple outlets. 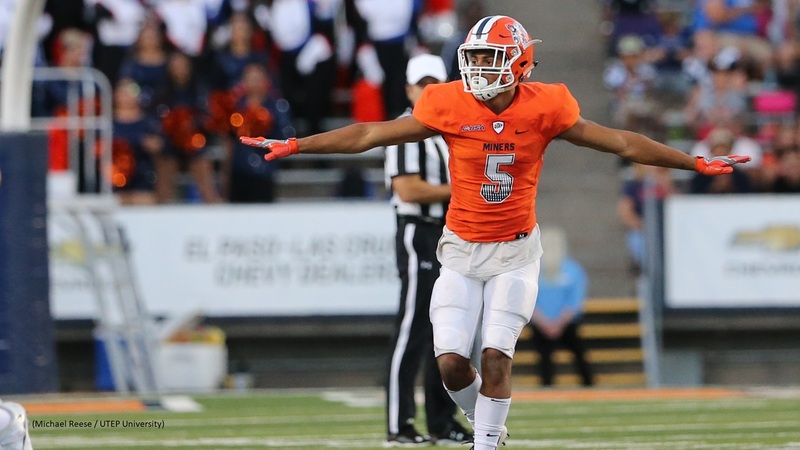 All except for Nik Needham, a senior cornerback for the UTEP Miners in 2018. He’s been a starter since his redshirt freshman season and is the all-time leader in passes defensed at UTEP. “I feel like I have been the underdog my entire career, even since high school. I was a 2 start recruit and only had one offer. So it hasn’t really bothered me because I’ve shown I can compete with the best,” Needham said when I asked why he thinks he’s flown under the radar during the draft process. Needham describes his game as a fundamentally sound shutdown corner. “I have great feet and eye discipline. I have the ability to make a play on the ball every game and lock up on the opposing team’s number one guy. I would also say I am versatile because I can be physical with a bigger WR and more finesse with a faster WR. I also can play in the slot as well,” said Needham. One of the things I immediately noticed when watching Needham was how quick and coordinated his feet are. He rarely misfired or panicked when receivers released and showed impressive ability to mirror at all levels of the field. Man coverage is one of Needham’s strengths. UTEP is in Cover 1 on the above play and Needham is lined up on Marquez Callaway (#1). Callaway gives Needham a good inside release, but Needham’s lightning fast feet take two steps and he quickly snaps his hips around to mirror and harass Callaway down the field. Needham also plays well when facing the quarterback in zone coverage. UTEP is in Cover 3 here when the safety responsible for the middle third runs up in reaction to the play action fake. Once again, Needham is lined up on Marquez Callaway, this time at the bottom of the screen. Needham is essentially covering Callaway man to man even though he is facing the quarterback in zone coverage. Needham almost immediately recognizes that Tennessee is going deep, flips his hips and starts to bail. Matching Callaway stride for stride 40 yards down the field, Needham is still able to jump up and locate the ball to make an awesome pass defense. UTEP is in Cover 3 again and Needham is once more locked up in man coverage on the single receiver. Needham’s footwork is excellent, he’s able to match the receiver literally step for step. He gets hands on the receiver and picks on him all the way down field. The end result is Needham in perfect position and leaping to make a play on the ball for an extremely athletic pass defense. According to Sports Info Solutions, Nik Needham averaged 1.59 yards per coverage snap in Cover 1 during the 2018 season. Needham was often left on an island to lock up whoever lined up opposite of him and it was rare to see him give up a big play. When it comes to studying players and refining his game, Needham enjoys watching Jalen Ramsey, Brent Grimes, Aqib Talib, Marcus Peters, and Richard Sherman. Needham’s talents on the football field go beyond defending the pass. He managed to impress near the line of scrimmage when defending the run and screens. Needham showed a consistent ability to shed blocks and make plays due to football intelligence and toughness. Middle Tennessee comes out in a boundary trips formation with Needham lining up on the single receiver at the bottom of the screen. As soon as the ball is snapped, Needham diagnoses the play and crashes down on the edge blowing up the left tackle’s block and Middle Tennessee’s stretch run. Needham was on fire this game, diagnosing this play multiple times. Midway through the 3rd quarter, UTEP is trailing 10-0 and UAB is threatening inside UTEP’s 5 yard line. Needham is at the bottom of the screen in 1-on-1 coverage. UAB runs a simple outside zone read option with UAB quarterback A.J. Erdely (#11) keeping the ball and bouncing outside. Needham is the only Miner left defending the goal line. With zero hesitation, Needham steps up and delivers a big hit, stopping Erdely short of the goal line. A huge play that contributed to a goal line stand. Needham was shaken up on the play but returned for the next defensive series. Middle Tennessee lines up in an empty set on 2nd and 8 to run one of their outside screens. Needham is again lined up to the boundary. UTEP’s coaching staff prepared the defense well for Middle Tennessee and it showed. The whole defense is ready for this screen including Needham, but the most impressive part of this play is how effortlessly Needham is able to shed and knock the receiver off balance with one arm. Louisiana Tech is running a power play that Jaqwis Dancy (#23) bounces outside to the sideline and goes for a huge gain. Needham is the last man in position to make a play on defense for UTEP. Needham’s speed is on display but what impresses me is his effort and how he tracks the run before he takes off. He never stops running and that saves a touchdown. At this point in the game, Tennessee has already secured a win but Needham is playing through the fourth quarter. UTEP is in Cover 1 when Tennessee decides to run a screen to Needham’s side. Needham shuffles back a step before he recognizes a play and instinctively breaks on the ball. Needham destroys the wide receiver and then lets him know about it. The corner’s heart and toughness have no reason to be doubted. Playing a Conference USA schedule with Tennessee being UTEP’s best out of conference opponent, Needham’s skills went largely unnoticed during the 2018 season. Needham did not receive an invitations to college all-star games this winter and has not been offered an invitation to the NFL Scouting Combine later this month. Despite the lack of attention and respect, Needham’s sights are set on being the best player he can be for his next team. “It’s an experience that I have been waiting and working for my entire football career. The training part is a little different from what I’m used to because we are working out 6 days a week, 2 times a day, but I’ve been embracing the grind and enjoying every moment of it,” said Needham. The pre-draft process is intense as players refine their games and get into the best shape they can before combines and pro days. Needham credits his father, Steve Calhoun, for being his biggest mentor throughout this process. “He’s been around football for a long time and really understands how the process is. He has always given me great advice throughout my life and has pushed me to be the best player I can be,” said Needham. Calhoun is a former quarterback at New Mexico State and started the Armed & Dangerous Football Camp in 2004 in Orange County, CA. He’s specializes in coaching quarterbacks and wide receivers from high school to the NFL. Calhoun has coached notable players including Nick Foles, Keenan Allen, Robert Woods and Russell Wilson. Needham was eligible to declare for the draft after the 2016 season due to his redshirt year in 2014. Needham returned twice to play for the Miners. The Miners went 4-8 in 2016, 0-12 in 2017 and 1-11 in 2018, so why did he return for your senior season in 2018? “One of the main reasons I came back for my senior year was the fact that our team went 0-12. I didn’t want to end my college career on that note. I wanted to regroup with my guys and figure out a way to leave a solid foundation for the future UTEP Miners. It did not go exactly as planned but we did break the losing streak my senior year and competed to the very end with the top teams in our conference,” said Needham. The Miners only victory in 2018 came when they beat Rice 34-26. Needham played a big role in the win having a couple highlight plays during the game. UTEP is in quarter’s coverage here with Needham playing at the top of the screen. Because there are only two eligible receivers on the top half of the screen, Needham is basically tasked with covering the wideout man to man. Needham is unfazed by the receivers release, fires his feet and locks his eyes onto the receiver’s hip. Needham opens up his hips and gets a hand on the receiver as he stems to the outside. He’s able to stay with the receiver on the quick break and makes a spectacular dive to notch the pass defense. The UTEP defense matches Rice’s tight formation and brings Needham in tight on the top of the screen. The run is right at him. Needham steps up to contain, is able to shed the fullback and grabs the runner by the ankle saving a potential big play. There’s not much more that Needham can do to improve his draft stock by February. UTEP’s Pro Day will be Needham’s final chance to prove to NFL teams that he has the talent necessary to play in the league. After that point, it’s out of Needham’s hands and up to the many people that operate the 32 NFL franchises. All Needham needs is one team to give him a chance. Follow Jake on Twitter @JakeSchwanitz. Check out the rest of his work here, including his look at how Sony Michel was eased into his rookie season, Oklahoma State running back Justice Hill, and Colorado safety Evan Worthington.